New England Lodge No. 4 Charter is text. Its dimensions are 11.5 in. x 14.7 in.. It was created on Wednesday, January 5, 1814. New England Lodge was represented under its original charter, granted by the Grand Lodge of Connecticut in 1803 until the Annual Communication of 1814. 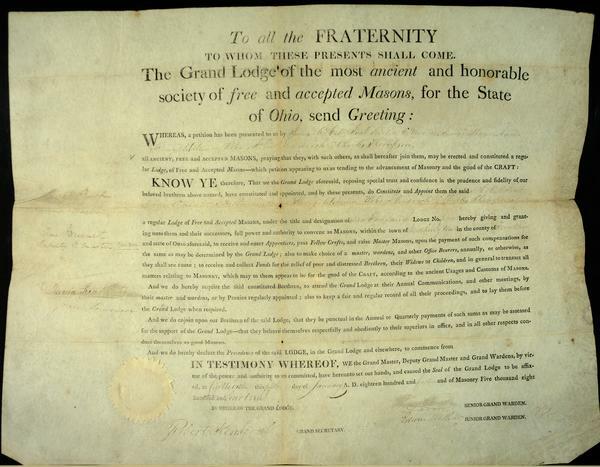 At that time this new charter was received from the Grand Lodge of Ohio. Charter members were James Hillis, Jacob Norton, C. Barker, James Kilbourn, Aaron Strong, William Robe, John Goodrich and Charles Thompson. It covers the topics freemasons, freemasons and charters. The Grand Lodge of Ohio Masonic Museum identification code is 1118. The Worthington Memory identification code is nel0009. This metadata record was human prepared by Worthington Libraries on July 20, 2003. It was last updated November 16, 2017.